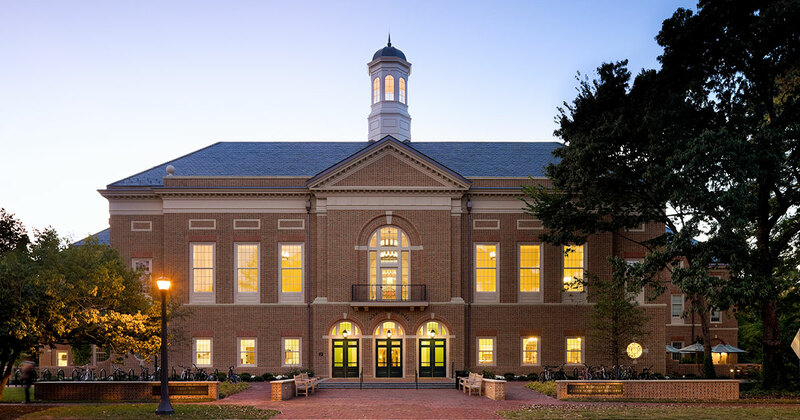 Technical depth in a practical setting highlights the William & Mary difference. While, most data science and business analytics programs have designed their curriculum to stress technical depth in a theoretical setting or business software packages in a practical setting, our curriculum has been designed to forge a new direction. When developing our program the faculty sensed an overwhelming need by industry for technical candidates with skills in business acumen and visualization. As such, a conscious decision was made to develop our program with a deep technical dive, while simultaneously learning how various methodologies can be used to solve practical business problems. Our intensive ten-month curriculum will teach you the requisite analytic skills to work with big data sets such as machine learning and artificial intelligence and to solve complex problems from multiple perspectives. The curriculum provides a “book-end” approach where business context is taught first, followed by intensive analytic methodology coursework, and ending with a final business application capstone project. Interwoven in each course in the program will be assignments which will require you to analyze data and present it in at least one of the common modalities used in business including verbal communication with presentation software such as PowerPoint or by written communication such as white papers, memos, and reports. This intensive course will include a survey of the state-of-the-art in business analytics: A review of companies that have used business analytics for competitive advantage and how they have done it. These topics will be initiated with a panel discussion on the first day of class. This course will teach business acumen and how the field of analytics fits within the context of business. Topics will include subjects such as: understanding balance sheets and income statements, budgets, business metrics as used for performance measurement and incentives, communicating with impact, visualization, the functions of a company; how they interact, and what data they have, and project management techniques. The course will also include: Survey of opportunities for problem solving using business analytics in operations, supply chain, human resources, finance, and marketing, and also an introduction to the tools that are covered in this program. Optimization is an analytics methodology found in all business analytics programs at the master's level. This course will provide knowledge in optimization and analytics that are the foundations of analytics methodology including the theory and application of optimization techniques such as linear programming, integer programming, mixed-integer programming, and stochastic programming. Intermediate Probability and Statistics is a foundation course in the study of business analytics. It provides an understanding of the principles associated with modeling of stochastic processes. The topics will include: probability theory (important probability distributions, sampling from distributions, interaction of multiple stochastic processes); statistical analysis (descriptive/ inferential/ predictive statistics, multivariate statistics, time series models); and modeling (modeling concepts, Monte Carlo simulation, decision analytics). Students will also be introduced to a variety of statistical modeling packages. Most business programs are too large or too complex to solve optimally, where the strict meaning of "optimal" means finding the "probably" best solution to a problem. Satisficing, or finding a heuristic solution that approximates the optimal solution is, therefore the predominant mode of problem solving found in industry. Having the capability of designing and executing heuristics that more closely approach optimal solutions creates a competitive advantage for companies. This course focuses on such methodologies where quick but good solutions to complex problems are needed so that they can be acted upon in a timely manner. The type of heuristic covered in this course is the algorithm, which is a sequence of steps taken to provide a solution to a problem. This course is designed to provide students with a deep understanding of the theory and practice of regression and classification, two of the most commonly used techniques in the data scientist's toolkit. These predictive analytics techniques and important members of a family of analytics often referred to as machine learning techniques, and they are the basis for more elaborate machine learning techniques that will be covered in a sequential course called Machine Learning 2. An important part of this course will cover a powerful and ubiquitous software package called R, which is used extensively in labs and assignments in this class and subsequently reappears in other classes throughout the program. This course is designed to provide students with a comprehensive working knowledge of a family of analytical techniques that have grown out of the Artificial Intelligence. Data Mining and Machine Learning communities over the last several decades. In recent years, these techniques have come into widespread use for business by data scientists, principally because they lend themselves to the discovery of relationships among variables that can only be found by examining the very large quantities of often unstructured data that characterize the world of big data. This course is designed to provide students with a deep, practical understanding of several of the most common and powerful analytical Machine Learning techniques in use by today's data scientists such as resampling methods, non-linear methods, Tree-Based Methods, Support Vector Machines, Text Mining and, from the Unsupervised Learning family of techniques, Cluster Analysis and Association Analysis. Internet-scale applications and modern business processes generate voluminous data pertaining to business vital signs, market phenomena, social networks that connect millions of users, and the habits of users and customers. Data produced in these settings hold the promise to significantly advance knowledge and provide business opportunity. This course covers fundamentals of database architecture, database management systems, database systems, principles and methodologies of database design, and techniques for database application development. The course also examines issues related to data organization, representation, access, storage, and processing. This includes topics such as metadata, data storage systems, self-descriptive data representations, semi-structured data models, semantic web, and large-scale data analysis. The data storage and retrieval techniques that have served the information processing industry for decades have proven inadequate in the face of the huge collections of data presently being created by the web and the so-called "Internet of Things." Businesses are requiring a new set of technologies that are specifically designed to deal with these huge data sets. In this course, MapReduce techniques will be taught which will include parallel processing and Hadoop, an open source framework that implements MapReduce on large-scale data sets. Other Big Data tools will be taught that provide SQL-like access to unstructured data: Pig and Hive. Finally, we will teach so-called NoSQL storage solutions such as HBase. This course introduces principles and techniques for data visualization for business. Effective visuals communicate information to maximize readability, comprehension, and understanding. Information visualization principles are drawn from the fields of statistics, perception, graphic and information design, and data mining. Students will learn visual representation techniques that increase the understanding of complex data and models. Human information processing and encoding of visual and textual information will be discussed in terms of selecting the appropriate method for displaying of appropriate data, both quantitative and qualitative. Topics include charts, tables, graphics, effective presentations, and dashboard design. Cases will be used from a variety of industries. This course provides competence in an essential set of tools that are not covered in other courses. Artificial Intelligence (AI) methods perform well in cases of large, complex problems, which is the focus of cutting-edge business analytics endeavors. This course covers AI methods such as genetic algorithms, neural networks, and fuzzy logic. AI comprises a set of essential analysis techniques for the modern data scientist who solves problems that encompass vast data sets and involve complex relationships. This course is taught in the last two and a half weeks of the Business Analytics Program and requires students to complete a comprehensive business analytics project, from start to finish. The projects require that students apply the knowledge gained in the preceding courses. Students will identify the most appropriate techniques for their projects and then apply one methodology effectively. Projects are characterized as requiring the analysis of vast data and solving complex problems. Several projects hosted by businesses would be offered, with the goal of representing multiple functions and industries to suit students’ interests. They will define and frame a complex problem, develop a systematic approach to solving it using analytics, generate an innovative solution and persuasively convey that solution using data visualization techniques and communication skills. A unique faculty supervisor will be assigned to each business analytics capstone team (average 4-5 students per team).